Our first travel tip is don’t go hungry when you travel to Australia and seek out those niche places to eat. This hidden gem is a little known off the beaten path pop-up donut shop. 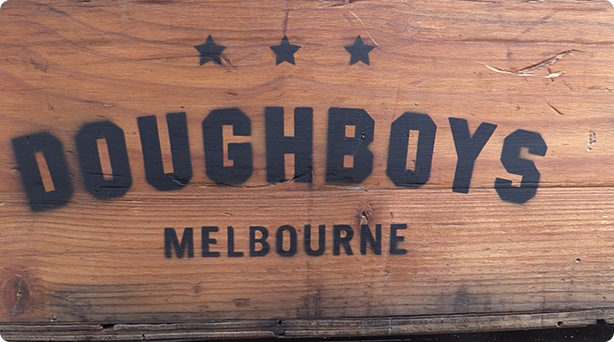 It is called Doughboys and they are located in Victoria Market. They are a “pop-up” so they can move from time to time and only there dedicated fans, and you, will know where to find them when you are in Melbourne. This Australia Summer (Jan – ?? 2014) they are at 456 Queen Street but always follow them on Facebook: https://www.facebook.com/doughboysdoughnutsmelbourne so you know where they will be camped out at. These are no ordinary donuts. Each one is hand made right there by Walter and Brook as you wait and it’s a joy to watch them craft all these unique flavor combinations.